Proud to be the Registration Sponsor for Digital Dealer 24! See us next to the DD24 Registration table for your free chat audit and SAVE 30% when you switch to Response Path! GET RESPONSE PATH A.I. MESSAGING SOLUTION & GET MORE FOR 30% LESS! 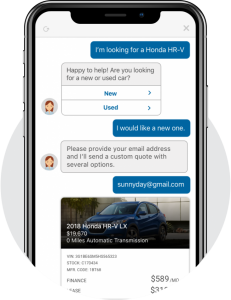 Learn how smart assistants can streamline your dealership and engage with car buyers and service customers so your top salespeople can focus on the human interactions that close deals.